Pushing vs pulling in the golf swing is an important concept to understand if you want to master the golf swing and get into a tour quality impact position. In the first video of the "Keys to RST" series, I showed you a simple physics lesson that showed how pushing can negatively effect your golf swing. In part 2 of this series, I am going to show you why you may be struggling with flipping the club or even battling the dreaded chicken wing. If you watch golf on TV, chances are you have noticed a ton of different ways to swing the club. However, most all professional golfers share one really important part of the swing in common...impact. A flat left wrist and shaft leaning towards the target is pretty much the exact opposite among amateur golfers. Getting into a tour quality impact position will increase your compression and distance immensely...but how do you do it? Well let's look at a couple of critical questions that you have probably not asked yourself in the past, to help you understand. Think about these 2 questions for a moment. If we play play right handed and we are right hand dominant, why would we wear the glove on the opposite hand? Why are golf grips tapered the way that they are? Why would we want to have the fattest part of the club in our smallest, less coordinated finger? Wouldn't we just want it to be skinnier at the top of the grip so it is easier to grip? Amateur golfers want to use their dominant side at all times, not knowing that this is the side of the body that is causing them to throw the club from the top, lose lag and get into that weak-flipped impact position. Your trailing arm is the only arm that is in a position to push the club causing you all of these poor impact conditions. 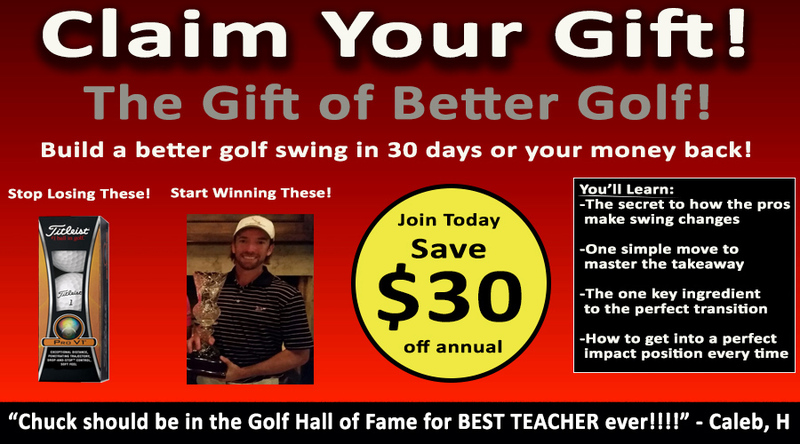 Get Your Free Membership to Finish Watching "Golf Impact - Part 2 of 7" Right Now!